The Los Angeles trio Sinicle are in the spotlight for this week’s Meet The Band. The group’s new album is Angels & Demons. 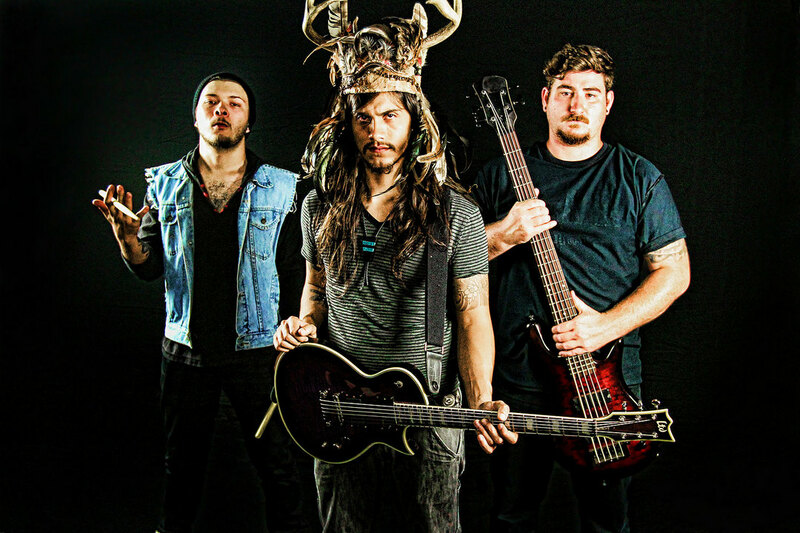 Vocalist/guitarist Drew Zaragoza introduces us to his band. Chad Bowar: Describe the songwriting and recording process for Angels & Demons. Drew Zaragoza: We starting writing the album two years ago and it was right after we parted ways with our original drummer who was a big part of the old sound. So we started fresh with this album and decided to write whatever kind of songs we wanted to write and ended up with Angels & Demons. We recorded in the studios at Musicians Institute during graveyard sessions from midnight to around 5AM. We also did some overdubbing at a few other places. I mixed the record and we had Maor Appelbaum master it. What are the pros and cons of producing it yourself? Pros: Total control and total responsibility. A band has to have a strong vision to produce itself. Its also a lot less expensive. We’ve worked with producers in the past that didn’t see our vision. I also think a lot of producers when working with up and coming bands tend to throw their own ego into the equation too much. Cons: More work, more stress. Producers can be very helpful, but just like any other relationship all the personalities have to gel and from my experience those producers not only cost a lot but are always busy because they have built a solid reputation. Diverse, not a one trick pony, not a trend follower. Why did you decide to go the DIY route in releasing the record? We reached out to a few labels and we weren’t satisfied with the offers. Record Labels aren’t giving advances like they used to but still want the same obligations from the artists. What has the response been to the songs and videos from the album you’ve released so far? The responses have been really good for videos, people seem to enjoy visuals these days. The “Baltimore” video has a party feel to it and I think that translates well over social media. A lot of people have said they have to listen to the album three times to get a grasp of it. It’s kind of like a Quentin Tarentino film in a way that scene by scene it might not make sense, but at the end everything comes together. What has been your most memorable Sinicle live show? Ozzfest Meets Knotfest 2016. I attended Ozzfest in 2006 and wanted to play ever since. We have a small west coast tour lined up for September! A band of kids played on my last day of middle school and they had the whole school rocking hard. I caught the buzz that day. My father was already a musician and I had some experience already, so by the time I got serious it was easy to get going. I met Justin the next year and he had a jam room with a drum set and I would bring over my guitar and amps and that was the humble beginning of Sinicle. We loved to play Ozzy and Black Sabbath when we very first started. The band War when I was about 8. Then a rap concert with Ludacris around 10, and finally Megadeth at 13. Those are all kind of firsts, right? Who’s the most famous person you’ve run across on the street in Hollywood/LA? We used to hang out with Lemmy Kilmister at The Rainbow when we had a residency there on Sunset Blvd. When I first moved to Hollywood I would see lots of famous people because I was consciously looking for them. Now I really don’t care and I’ll be at the gym or the bar and someone will say that’s so cool such and such is here and I don’t even notice. I used to work for a producer who was good friends with lots of rock stars like Steve Adler, Matt Sorum, Edgar Winter, guys like that and they would come into the studio while I was working. I wouldn’t notice a Kardashian if they were standing in front of me. But I often see musicians. At the moment nothing in metal has grabbed me. I’m eclectic in my music taste as I am in writing. I’ve been listening to singer songwriter stuff like Bob Dylan and lots of jazz like Miles Davis. Huge shout outs to Clawhammer PR, Reunion Blues, EMG Pickups, Pighog Cables and all of our fans. More band info can be found at Bandcamp, Twitter and Facebook.